Our love of plantains began while we were living in Miami. Miami is home to a huge population of Cubans. There is even a neighborhood in Miami known as "Little Havana" in reference to the capital of Cuba. Naturally there are also a ton of Cuban restaurants in Miami and they all serve some form of plátanos maduros (fried plantains) on the menu. Plantains are a staple of Latin American cuisine, and can even found in a few West African dishes. There are many ways to cook plantains, these methods are all dictated by the plantains stage of ripeness. Plantains are similar to bananas but tend to be firmer and lower in sugar content. Plantains are usually cooked while bananas are predominately eaten raw. Plantains like bananas start off very green signifying that they are unripe. These unripe or Green Plantains are starchy like potatoes and have a similar flavor and texture. It is no surprise then that green plantains are often fried into chips. As the plantain beings to ripen it will become softer and sweeter. 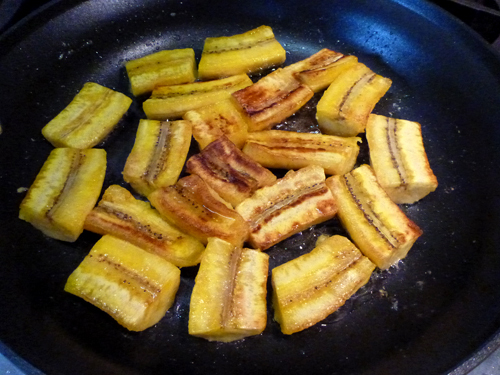 When making a dish that calls for sweet plantains you should choose one that is black and yellow. Unlike a traditional banana, these black and yellow plantains have not gone bad. They have simply ripened or overripe to the perfect state for a sweet dish. We like to eat our sweet plantains with Pernil (pork shoulder) and Rice & Beans covered in hot sauce. 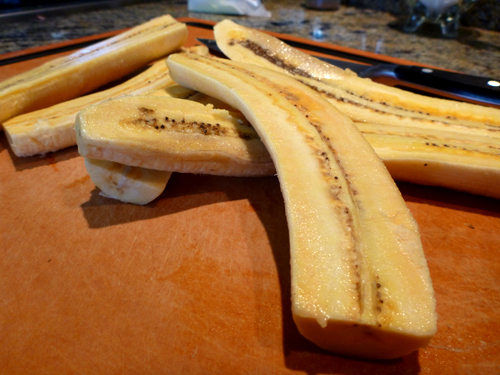 The pork tends to have saltiness that gets cut buy the sweetness of the plantains. All of this mixed in with the Rice & Beans provides it is a perfect marriage of sweet and Savory. Fortunately there is a large Spanish population in New York City and we have been able quench our sweet plantain cravings even after leaving Miami. The time has come however that we learn to make our own. When looking for a recipe we found one from our favorite chef Tyler Florence. His recipes have not disappointed us before, so will his streak continue? keep reading to find out. To peel the plantains, cut off ends and discard. With a paring knife, make 3 shallow slits lengthwise along the seams of the skin and peel away. Split the plantains lengthwise. 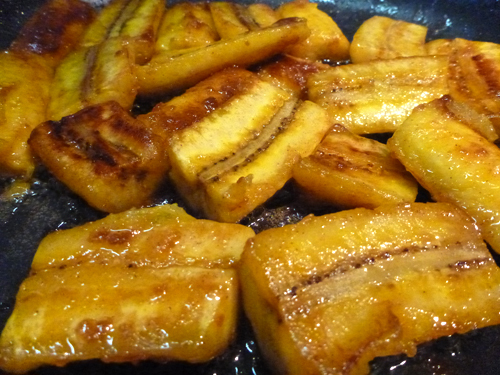 Fry the plantains in a single layer, until golden on the bottom then turn over with a spatula. Add the cinnamon, vanilla, and sugar and let cook a few more seconds, just to begin caramelizing the sugar. Just before serving, melt remaining tablespoon of butter to finish the sauce. Serve immediately. These plantains came out very good. They were super sweet and had a great soft texture. The flavor profile was jacked up a few notches thanks to the Vanilla and Cinnamon. 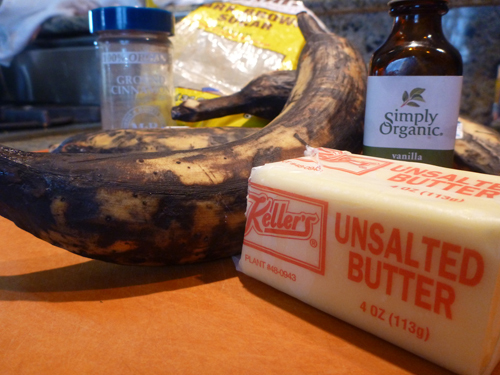 Both of these ingredients are not traditionally added to plantains in most Cuban/Spanish restaurants, but they do add great flavor. Traditionally these plantains would just be fried in butter or oil until they caramelized, sometimes with a small amount of brown sugar. We were however pleased with Tyler's take on plantains. They would work well as a side dish to any savory Spanish dish. They could even be served with ice cream as a desert. Sweet plantains are a great side dish. This recipe produces a great take on a traditional plantain that can function as a complement to your main dish or a star in a sweet desert. This recipe is a Should Eat for us and if you have never had sweet plantains you should definitely give them a try.